So I’m all about easy crafts that are adorable as well. Turkeys seem to be perfect subject matter for these types of crafts. So when I found some leftover colored craft sticks and some feathers, I know W and I were making some turkeys because I’m a huge Thanksgiving fan! And I love how quick and easy this craft stick turkey was to make! Normally I would have used only red, orange, yellow, and brown feathers to go along with colors that remind me of fall and Thanksgiving. But I didn’t have all of those in my leftover feathers so I added the light blue feather as a bit of an accent. I have to admit that I love it! So this is a great craft for leftover supplies and being creative with colors makes it fun! If you have plain craft sticks rather than colored and want to paint them, paint desired color and allow to dry. Glue the feathers on one side of the craft stick and allow to dry. Glue googly eyes on other side of clothespin. Snip a small triangle of orange construction paper below eyes to make the turkey’s beak. W loves to play with these along with our Clothespin Turkeys! These craft stick turkeys could find a home on the dinner table or they could be fun seasonal bookmarks. Or just a ton of fun to make and play with! Such a cute and easy idea. My daughters are 6 and 9 and would LOVE to make these. Thanks for the idea! Always love your crafts… because I can actually do them! 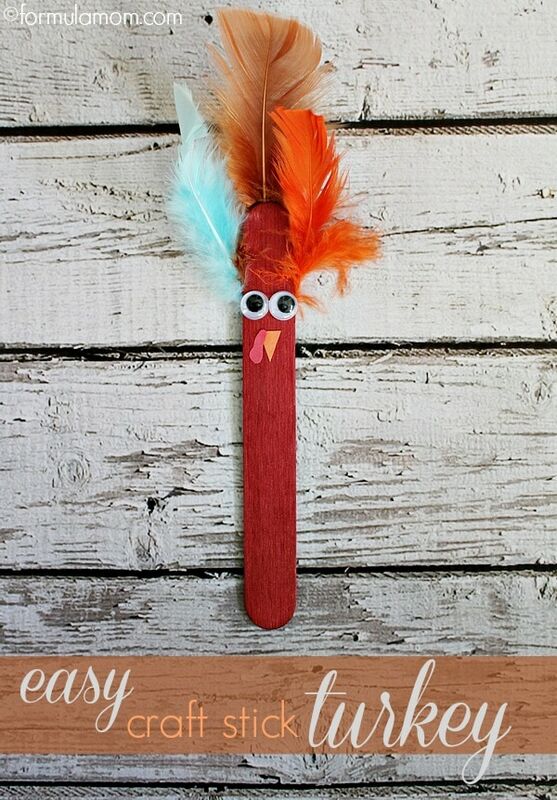 This Craft Stick Turkey will be perfect to do with the girls later this month! Pinned so i can find it easy later. This is cute – wish I had known about this when my kids were littles, but it has given me an idea for center pieces. That is just adorable! I like that it’s not messy either. Thank you for sharing! Boom! Fast, easy and super cute!! I love this Thanksgiving craft! Very cute craft. I love making crafts with my kids. Its a great way for us to spend time together. So easy and so adorable! I love that you used a light blue feather in his feathers! 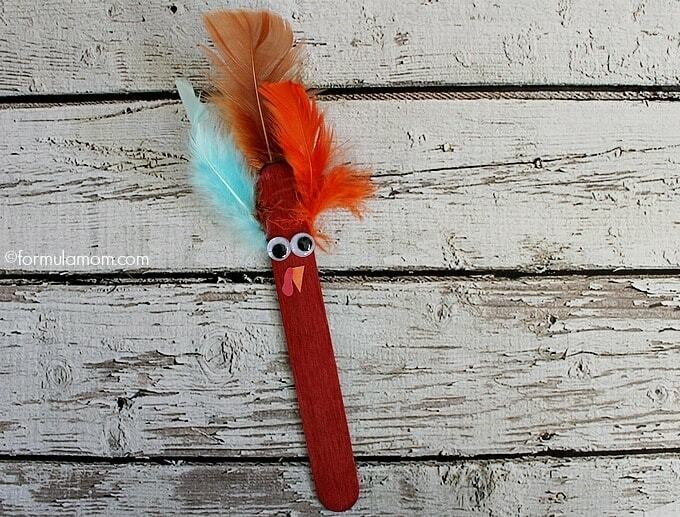 This Craft Stick Turkey is so cute – and easy to make. Thanks for sharing simple crafts that my 3 year old would enjoy. I am going to pick up some craft sticks this weekend so we can make these. I am thankful for my family and my job. And this is such a cute, easy craft!! I really wish I was crafty! you have no idea how many craft posts I pin that I never get to do! This is so adorable! And I know my son would love to do it! That is such a cute craft for kids! I’m thankful that I have a healthy, loving family that I can do cute crafts with like this one! Adorable! What a cute craft stick turkey. My kids will have to try teaching this one in their 4H group. These are too cute! I just love all your craft ideas! This is another one the kids would enjoy doing! That is so cute! Thanks for sharing. I want to do this easy craft with my kids. This is a super cute craft, I’ve done something similar to this at the daycare I use to work at. The kids also enjoyed making little pilgrim outfits and taping them to the front of other sticks. What a cute easy craft.